You’ve likely heard some variation of the statistic that there are at least as many microbial cells in our body as human cells. You may have also heard that the microscopic bugs that live in our guts, on our skins, and every crevice they can find, collectively referred to as the human microbiome, are implicated in human health. But do these bacteria, fungi, archaea, protists, and viruses cause disease, or are the specific populations of microbes inside us a result of our state of health? That’s the question that drives the research in the lab of Andrew Goodman , associate professor of microbial pathogenesis at Yale University. Suppose you were a police detective investigating a robbery. You’d appreciate having a stack of photographs of the crime in progress, but you’d be even happier if you had a detailed movie of the robbery. Then, you could see what happened and when. Research on cells is somewhat like this. Until recently, scientists could take snapshots of cells in action, but they had trouble recording what cells were doing over time. They were getting an incomplete picture of the events occurring in cells. Researchers have started solving this problem by combining some old knowledge—that DNA is spectacularly good at storing information—with a popular new research tool called CRISPR. CRISPR (clustered regularly interspaced short palindromic repeats) is an immune system feature in bacteria that helps them to remember and destroy viruses that infect them. CRISPR can change DNA sequences in precise ways; and it’s programmable, meaning that researchers can tell CRISPR where to make a change on a DNA strand, and even what kind of change to make. By linking cellular events to CRISPR, researchers can make something like a movie that captures many pieces of information in the form of DNA changes that researchers can read back later. These pieces of information include timing, duration, and intensity of events, such as the turning on of a specific protein pathway or the exposure of the cell to pathogens (i.e. germs). Here, we look at some of the ways NIGMS-funded research teams and others are using CRISPR to capture these kinds of data within DNA sequences. An audio recorder stores audio signals into a magnetic tape medium (left). Similarly, a microscopic data recorder stores biological signals into a CRISPR tape in bacteria (middle). An enormous amount of information can be stored across multiple bacterial cells (right). Credit: Wang Lab/Columbia University Medical Center. MIT bioengineers, led by Timothy Lu, have devised a memory storage system illustrated here as a DNA-embedded meter that records the activity of a signaling pathway in a human cell. Credit: Timothy Lu lab, MIT. CRISPR uses an enzyme called Cas9 like a surgical knife, to slice both strands of a cell’s DNA at precise points. A cut like this sends the cell scrambling to repair the damage. Often, the repair effort results in changes, or errors, in the repaired strand that pile up at a known rate. Timothy Lu and his colleagues at the Massachusetts Institute of Technology (MIT) decided to turn this cut-repair-error system into a way to record certain events inside a cell. They call their method mSCRIBE (mammalian synthetic cellular recorder integrating biological events). Educators often struggle to teach teens about sexual and reproductive health. Hexacago Health Academy (HHA) , an education program from the University of Chicago, leverages the fun activity of gameplay to impart these lessons to young people from Chicago’s South Side community. Funded by the Student Education Partnership Award (SEPA), part of the National Institute of General Medical Sciences (NIGMS), in 2015, HHA assists teachers in their goal of helping teen students gain awareness and control over their health and also learn about careers in STEM and health fields. Melissa Gilliam, founder of Ci3. Credit: Anna Knott, Chicago Magazine. HHA was cofounded by Melissa Gilliam , a University of Chicago professor of Obstetrics/Gynecology and Pediatrics and founder of the Center for Interdisciplinary Inquiry & Innovation in Sexual and Reproductive Health (Ci3) . During a 2013 summer program with high school students, Gilliam and Patrick Jagoda , associate professor of English and Cinema & Media Studies, and cofounder of Ci3’s Game Changer Chicago Design Lab , introduced the students to their STEM-based alternate reality game called The Source , in which a young woman crowdsources player help to solve a mystery that her father has created for her. From their experience with The Source, Gilliam and Jagoda quickly learned that students not only wanted to play games but to design them too. What followed was the Game Changer Lab’s creation of the Hexacago game board, as well as the launch of HHA, a SEPA-funded project that the lab oversees. At the core of HHA is the Hexacago game board , which displays the city of Chicago, along with Lake Michigan, a train line running through the city, and neighborhoods gridded into a hexagonal pattern. 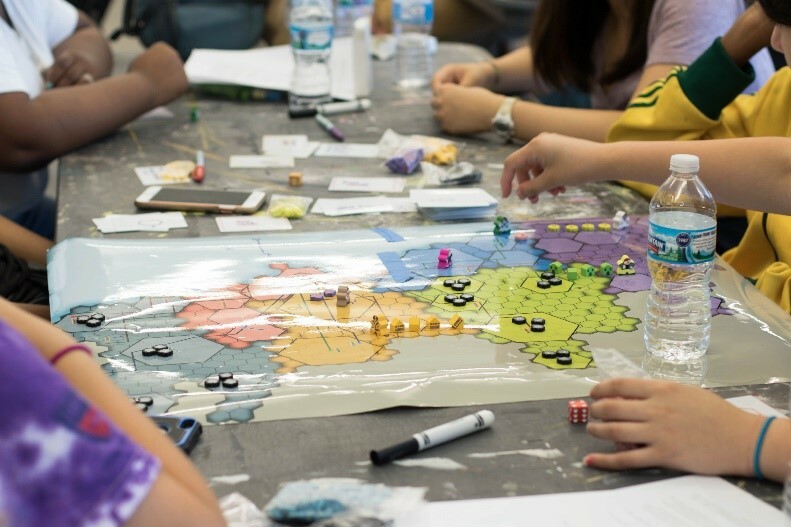 HHA students not only play games designed from the Hexacago board template, but also design their own games from it that are intended to inspire behavior change in health-related situations and improve academic performance. Credit: Ci3 at the University of Chicago. In this way, HHA is much more than just game design and play. “Students have no idea that what they’re doing is learning. In their minds, they’re really focused on designing games,” says Gilliam. “That’s the idea behind Hexacago Health Academy: helping people acquire deep knowledge of science and health issues by putting on the hat of a game designer.” Moreover, through the process of gameplay and design, students practice all the rich skills that result from teamwork, including collaborative learning, leadership, and communication. For more than 30 years, NIGMS has supported the structural characterization of human immunodeficiency virus (HIV) enzymes and viral proteins. This support has been instrumental in the development of crucial drugs for antiretroviral therapy such as protease inhibitors. NIGMS continues to support further characterization of viral proteins as well as cellular and viral complexes. These complexes represent the fundamental interactions between the virus and its host target cell and, as such, represent potential new targets for therapeutic development. In this third in a series of three video interviews with NIGMS-funded researchers probing the structure of HIV, Michael Summers, professor of biochemistry at the University of Maryland, Baltimore County, discusses his use of nuclear magnetic resonance (NMR) technology to study HIV. Of recent interest to Summers has been using NMR to investigate how HIV’s RNA enables the virus to reproduce. His goals for this line of research are to develop treatments against HIV as well as learning how to best engineer viruses to deliver helpful therapies to individuals with a variety of diseases.